The Bali House - a Tropical Paradise in North Carolina! Total Privacy awaits you in the Bali House, which is a half acre private garden and guest house surrounded by walls on three sides and woods on fourth side. Furnished with a queen-size, four poster bed, drapes to separate the living area and bedroom, Brazilian cherry hardwood floors, oriental rugs, granite kitchen counter tops, and a wonderful collection of Southeast Asian art. The living area has sliding glass doors opening to a large Balinese-style verandah overlooking a koi pond with waterfalls, a stream, and many pieces of statuary and other artifacts. This unique tropical Balinese-style guest house and garden is a perfect place for couples or individuals looking for comfort, privacy, and serenity. The Bali House was an absolute paradise located right in the middle of town. We had a great staycation and enjoyed the relaxing environment of the Bali House! One of the most unique stays in Wilmington. Very secluded and peaceful - highly recommended. Staff is also very responsive should you need anything. Very nice. Concept is done well. Unique. Because of the water/hurricane, it smelled a bit musty. Can’t believe this sanctuary even exists in Wilmington! Extremely peaceful and restorative - we used it mostly as our place to sleep, but it would be a great spot to just hang during the day too. There are not enough words to quantify how special this place is. It completely and absolutely speaks for itself. Remote, tranquil, peaceful, and quiet, that’s what we wanted and we got it. Truly, the best kind of escape. We feel like we got lucky. Thank you for creating such a beautiful space and for sharing it. We love it and we will most definitely be back. The Bali House is a world of paradise that doesn't require a passport to visit. My wife and I have been blessed to be able to travel to many wonderful destinations. We enjoyed our time at each location, but in the end, we were ready to return to our home. The only exception to this has been Greece, until now. We did not want to leave the Bali House. Instead, I want to live there! The owners have created an oasis of peace and tranquility that envelopes you and keeps you enthralled! The entrance to the garden transforms into a gateway to paradise. The Bali House blends so artfully into the lush tropical garden that you barely register the presence of the house. The covered veranda adjoins the large koi pond allowing visitors to sit outside ( regardless of the weather) and be captivated by the view of the pond and gardens. All of your normal daily worries and concerns are whisked away as you find your inner peace in this tranquil sanctum. The Bali House itself is a studio design with designated areas that serve as living room, kitchen/dining and bedroom. The open floor design allows for spectacular views of the pond and garden from any interior location. The house is completely comfortable for a couple with all the amenities you could ask for as well as a few you didn't know you wanted (the shower has 6 additional spray jets). 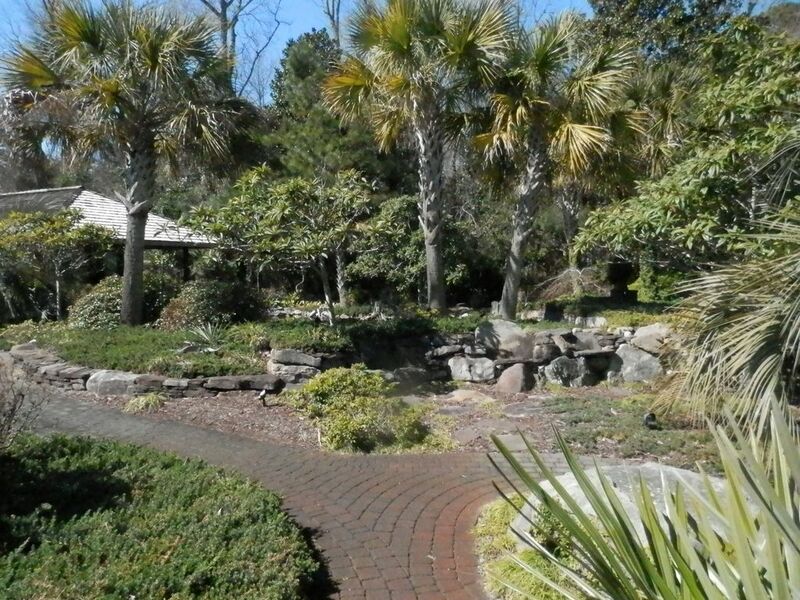 While the privacy of the Bali House seems worlds away from civilization, it is actually conveniently located in Wilmington as to be less than a mile from many fabulous restaurants, breweries and stores. Everything you could need is nearby, but why would you want to leave the Bali House to reenter the world?